New withholding rules on the sale of property by foreign residents have been introduced, turning purchasers into tax collectors. The new tax rules apply where real property contracts are entered into on or after July 1, 2016, but only apply to sales of residential property where that property has a market value of $2 million or more. Withholding tax will not apply to sales by Australian resident sellers, but these sellers will need to obtain a clearance certificate that they can provide to the purchaser. Otherwise, 10% of the purchase price will need to be remitted to the ATO. The ATO says it has already communicated to real estate agents, conveyancers and legal practitioners to help the industry be prepared to support their clients in meeting their withholding obligations. Australia is not the first country to introduce withholding arrangements to make sure foreign residents pay capital gains tax on the sale of residential property. Similar tax rules already exist in many other countries, including in Canada, France, Spain, Japan and the USA. The ATO says that most property sales are for less than $2 million and will therefore be completely outside the new rules. The withholding also does not apply to sales by Australian residents where a clearance certificate is provided to the buyer. Additionally, sellers can claim the credit for the withheld amount paid to the ATO by lodging a tax return for the relevant year. For purchases of property with a market value of $2 million or more from a foreign resident seller, a 10% withholding will be incurred on these transactions at settlement. 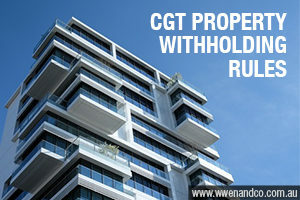 The withheld amount will be credited against any capital gains or income tax payable by the seller on the sale. The ATO says where a buyer fails to withhold tax when they should, a penalty may be incurred which will be equal to the amount that was required to be withheld and paid – plus interest. The ATO says clearance certificate application forms are already available to download through its website (or ask your friendly accountants at our Epping office) for a copy. No ATO fee applies for clearance certificate applications. A clearance certificate is valid for 12 months from the date of issue, and must be valid at the time it is made available to the buyer.